Toads – Ravenshill Woodland Reserve. Every winter toads that spend the summer in the wood hibernate until spring. In late February or early March they emerge and move to the pool they were born in to breed. For the toads that move to Lulsley lagoon, this means that they have to cross a busy road. They do this at night, often pausing for a while on the tarmac, because this absorbs heat during the day and so is warmer than the surrounding soil. We would normally go out each evening and collect the toads, check their condition and then take them across the road to Lulsley Lagoon. Over the ten years to 2007 the best year totalled in the region of 200. A good number you might think. Well in 2008 we took part in an experiment, erecting a mesh fence for 100 meters along the edge of the road to block the toads route. They would try to move around this, and fall into buckets dug into the ground along the fence line. We Collect them each morning. A much easier and safer option. 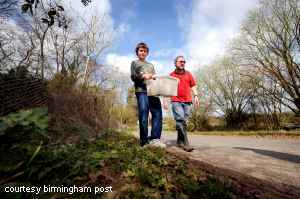 The first toads were caught on 25th february 2008 with a total of 593 safely moved across the road. This has proved to be so successful we now use the same method each year.